Liver tumors may be less of a risk if you drink coffee regularly. 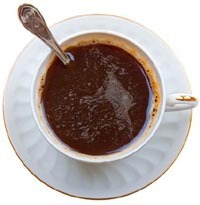 A study of more than 60,000 people in Japan found that those who drank this popular brew daily had half the risk of liver cancer than those who never had coffee. “It contains polyphenolic antioxidants, though to contribute to cancer prevention,” said Dr. Euan Paul, executive director of the British Coffee Association. Italian researchers have lent more evidence to coffee’s protective effect against liver damage. The researchers from the Mario Negri Cancer Center in Milan concluded that coffee offers heavy alcohol drinkers significant protection against associated liver damage. Subjects who drank at least four cups of coffee a day were found to be five times less likely to develop cirrhosis than heavy alcohol drinkers who don’t consume coffee. The same level of protection was also found for liver tumors.